Th-INK-ing of You: A little bit country sneek peek! Hello friends! I'm popping in with a quick sneak peek at a set to be released Feb 1 by Our Daily Bread designs. This set is called Chalkboard Hymns. The set is designed to be a chalkboard stamp, but the possibilities are limitless with how you can use these stamps. I decided to stamp it with Colorbox Pigment ink and then clear heat emboss it for this card. I'm sorry the photo isn't great... the highlights of the embossing seem to make some spots seem lighter than others, but I took so many photos and could not fix the problem. Anyhoo... This card is on Groovy Guava base and I used My Mind's Eye Bramble Rose design paper from AC Moore. I also had a linen tag that I cut down in size and sewed a little mixed stitch around. I added a little lace, a hand crocheted flower and a Prima wood button. Very CAS for me, but I like the country feel of it. I also love this hymn! While I love the new worship music, I do miss some of the old hymns too! Thanks for stopping by.... stay tuned for another awesome release coming soon at ODBD!!! Very nice. Great colors. Thanks for playing along at TTCRD. Gorgeous card, Grace! Really love how this one turned out! Hope everyone at your house is doing better! Hugs! So pretty, I love the canvas and the beutiful dp. Yes, so country, just love the pocket upside down and the verse is beautful. Great job. I love it! I am from Idaho and it makes me think of country living! neat stamp and I just love it against that red and like the stitching you did around the tag, great country feel to it! Such a beautiful vintage looking card you have created, love the little flower. Thank you for sharing with us at Lady Anne's Challenges. I hope we see you again soon. This is lovely, Grace. I like the idea of stamping the image in red. It really makes this card pop! Hi, Grace! I hope you and Alan are doing well! I've been praying for his continued comfort and healing. Your card is very nice! Good choice of cardstock and all. Pretty! Pretty!! Thanks for joining us at the ColourQ!!! 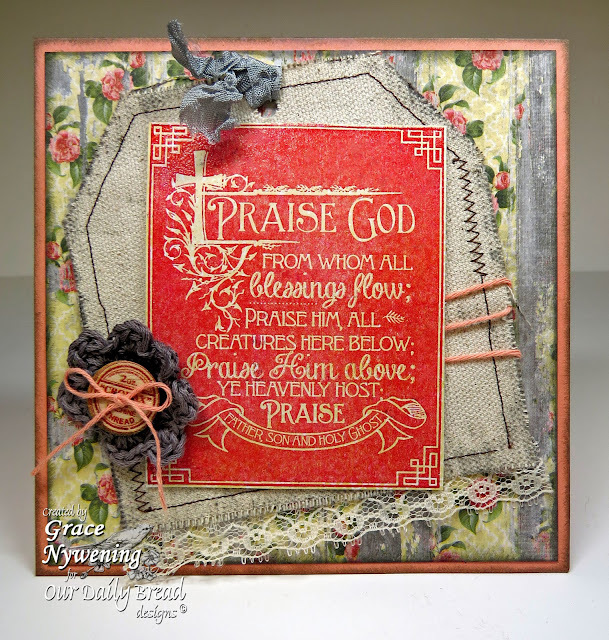 Oh Grace this is stunning - I too love the old hymns... just may be tempted with this release. Such a pretty card with fab details, love the flower! This is so bright, cheerful and beautiful!! I love the orange and all the added texture!! Gorgeous my friend!! Very pretty. Love the new stamp. A lovely looking card. Thanks for playing with us over at the Paper Shelter this week. Brace - this is even more beautiful the second time around. Such a beautiful and breathtaking creation. Amazing vintage feel to your card! I love the crocheted flower with the buttons an awesome added texture to your card. Thank you so much for sharing your amazing creation for us at 4 Crafty Chicks. Beautiful! I love the layout and colours. The card is just perfect! Thank you for sharing this delightful project with us over at Crafting For All Seasons.